Preti Flaherty is pleased to announce that attorney Jaclyn N. Fisher has joined the firm. Jaclyn will practice in the Business Law group from the firm’s Concord, New Hampshire, office. She joins Preti Flaherty after a year of experience with another firm in the Concord area. Jaclyn brings with her a strong background in business. A Daniel Webster Scholar at the University of New Hampshire School of Law, she is the recipient of the Yacos Award for demonstrating exceptional merit in commercial legal studies, among several other distinctions. 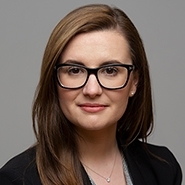 At UNH Law, Jaclyn focused on corporate governance issues, transactional law, and tax law, and was managing editor of the University of New Hampshire Law Review. She has also held positions as a legal intern in the New Hampshire Public Defender’s Office and as a legal extern for the Honorable Judge Johnstone of the U.S. District Court for the District of New Hampshire. Prior to law school, Jaclyn received a bachelor’s degree in Government from the University of Maryland, College Park. While an undergrad, Jaclyn worked at a lobbying firm in Washington, D.C., and for the Federal Labor Relations Authority. Jaclyn is admitted to practice in New Hampshire. She lives in Concord, New Hampshire.